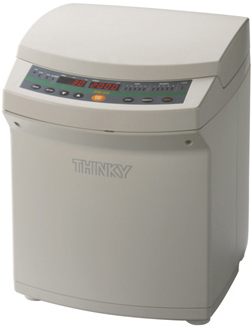 THINKY was founded in 1971 as a company manufacturing digital measurement instruments. With the need of an equipment which gives a quality mixing product Thinky Planetary Centrifugal Mixer was introduced to the world. It became world-class manufacturers for planetary propeller-less (Blade less) centrifugal mixers from Japan. The Centrifugal Mixer; mixes, disperses materials uniformly and de-aerates at the same time. THINKY mixers can mix materials with viscosity as high as 1 million micro poise in just a few minutes while de-aerating at the same time. It is the first company to develop stirring bladeless planetary centrifugal mixers. THINKY has vast range of containers and adapters and a strong track record in delivering them to our customers, to satisfy the customers need and specific properties like low-temperature insulation or heat resistance. Our efforts to achieve the level our customer's desire and to bring out the optimum performance of our unit, took us through several thousand prototypes to create a range of over 300 types. Containers and adapters are vital elements to expand the performance of your product. 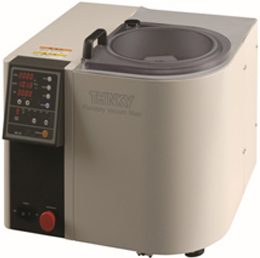 Special purpose machine that can optimize temperature and viscosity preparations and dispersion and de-aeration of solder paste at the same time. 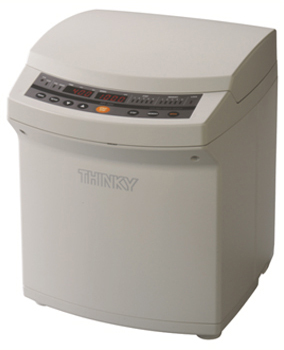 The standard model of the non-vacuum THINKY MIXER series. Provides simultaneous processing of mixing, dispersing and de-areation of high-viscosity materials with a force of 400G. Combining vacuum pressure reduction function with rotation and revolution mixing enables efficient elimination of submicron-level air bubbles. With rotation and revolution movement under vacuum pressure reduction, de-areation of high-viscosity materials; which was considered difficult, can now be performed with excellent quality.